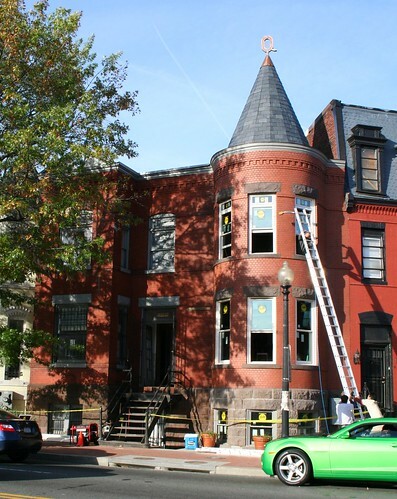 This summer we wrote about 607 605 Florida Avenue, whose turret was destroyed by a drunk driver in 2006. After four years of legal wrangling and other headaches, the reconstruction is nearly complete. We took the first photo this summer and took the second photo on Sunday. The exterior brickwork is beautiful. 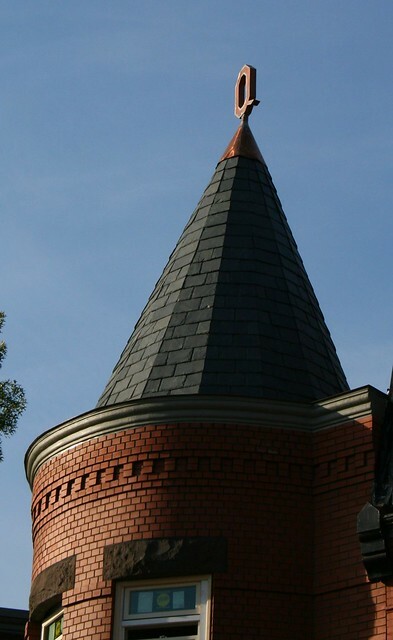 The owner, whose last name is Quarterman, has adorned the turret with a copper ‘Q’ finial, adding a distinctive personal touch. this is proof that “new” construction can look beautiful, if the time and money is actually invested and attention is paid to detail. Kudos to the owners and their contractors. Traditional brick and stone masonry done the right way. As opposed to that awful masonry “restoration” job at 4th and Fla. The clumsy stone repairs there look like they were sculpted out of gingerbread. I don’t know how that technique ever got by the Historic Preservation Office. Nice! It’s great to see someone take the time and money to do the job the right way. 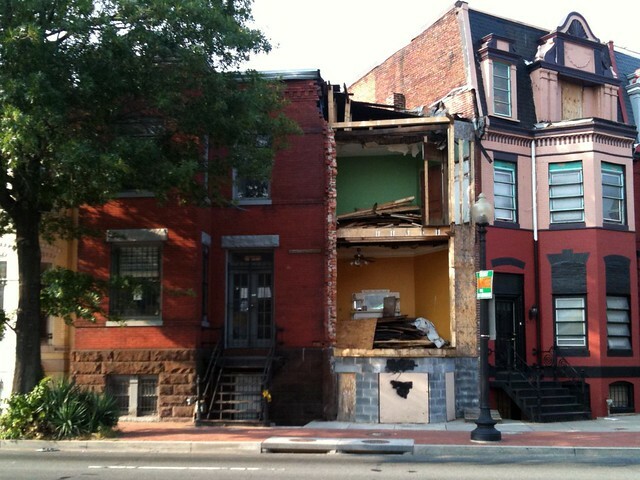 Please note the address of this property is “605 Florida Avenue NW” not “607” Florida Avenue NW. THANK YOU to the owner (Mr. Q?) for helping keep LeDroit Park special. When I first saw it I was thouroughly impressed. My expectations were low, but the brick work is fantastic, the right windows were chosen, and while I am a traditionalist on the finial, I do appreciate the whimsy on the “Q” and certainly Mr Q desrves this visual personal pat on the back through the all the legal wrangling. I do have one question, why was it not possble to make the roof round? I assume it was an issue of cost or was it something else. I thought this was merely done by soaking the boards and wrapping them much like a wooden ship. I suppose in the time lies the cost.